Patty Naffziger waits with home health aide Carrie Johnson for the Community Employment Shuttle to take her to work outside of Carpenter Hall. A home health aide usually comes to Patty's apartment around 6:30 a.m. Tuesday through Friday to cook, shop, clean and help Naffziger before she leaves for work. 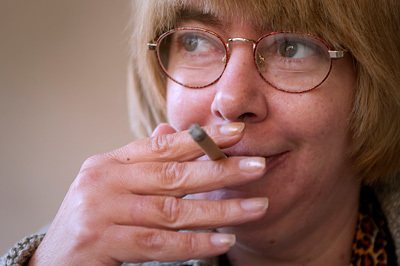 Patty Naffziger takes a quick smoke break outside Carpenter Hall before taking the shuttle to work. "I love cigarettes. That's my better half." 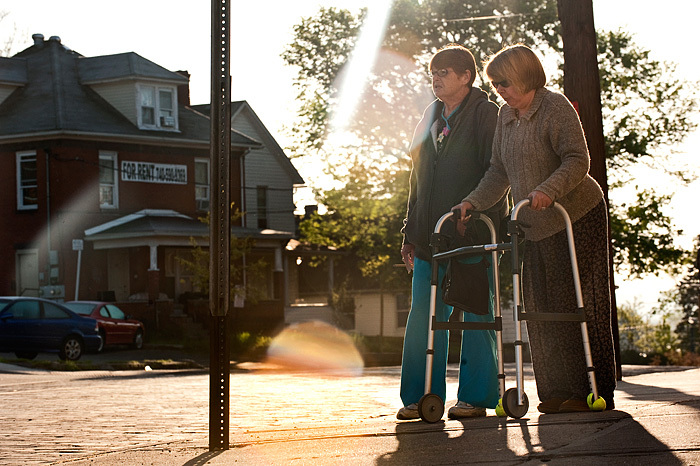 Naffziger rides the Athens County Board of Developmental Disabilities Community Employment Shuttle from her home at Carpenter Hall to Fruth Pharmacy where she works two hours a day, Tuesday through Friday. The sun is shining on the spotless parking lot in front of Fruth Pharmacy in Athens, Ohio. The inside of the store is just as tidy as janitor Patty Naffziger picks tiny pieces of paper that even a vacuum cleaner might have missed off the carpeted floor. She’s focused and friendly, and every other regular customer who passes by seems to know her well. They know her name, ask her how she’s doing and seem genuinely interested in her well-being. Patty says she loves to clean. She supports her body with a shopping cart because of her cerebral palsy, but she moves with a purposeful quickness, flying through her list of cleaning duties. Although cerebral palsy and a few other health problems are obstacles to Patty’s day-to-day activities, her family, friends and various agencies provide support and encouragement that have already allowed her to take strides toward her goal of leading an independent life. Patty first lived independently in a rough neighborhood in Youngstown, Ohio, where she witnessed much violence. A man in her complex committed suicide. A person waiting at the bus stop with her was stabbed to death. One night, Patty called her sister Deni Naffziger after she returned from a birthday party with an ex-boyfriend, who had been threatened with a gun to his head. “Is that normal?” Patty had asked her sister. Shortly after, Patty was moved to group housing in Illinois, where her parents lived. When Patty’s parents moved away from Illinois, her sisters, Debi Anderson and Deni, decided to move her to Athens, where they had lived for several years. Deni says she has never regretted moving Patty to Athens. In Illinois, Patty was often treated as a child and faced long lists of rules to follow in her room at the group home. The home also was isolated, and there were few activities. Debi, who is a special education teacher at Athens Middle School, contacted local disability agencies to help Patty. Patty’s environment eventually evolved from institutionalized monotony to her personally decorated, furnished apartment at Carpenter Hall. She also found her job at the pharmacy through Personnel Plus, a local training and employment center for disabled people, and an opportunity to be an artist at Passion Works Studio. 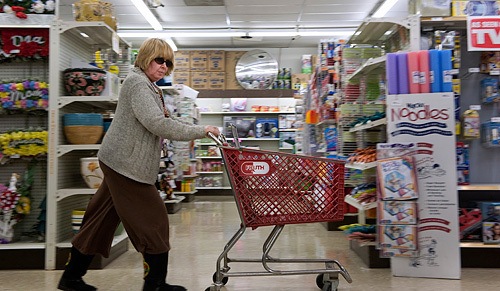 Looking like a customer, Patty Naffziger uses a shopping cart to support herself in the aisles of Fruth Pharmacy. The cart allows her to collect trash and take it out to the dumpster without using her walker. "This is the nicest place I've ever worked," Naffziger said. She also cleans the bathrooms and does anything that needs doing. "I'm keeping this job 'til I'm 90." 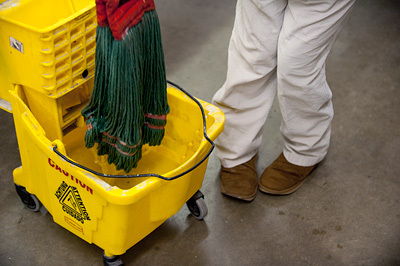 Patty Naffziger mops the bathroom floors at Fruth Pharmacy. Though cerebral palsy gives Naffziger an abnormal gait and causes her to walk on her toes, she is a hard worker. "I like to keep busy . . . you've got to get out and do something with your life." Not many disabled people, however, have the extensive support Patty has. In most other instances, care comes from paid interim nursing staff members, while “natural supports” — such as family members, friends or significant others — have a minimal presence. But the Naffziger family has always been close, Deni said. Margaret Wharton, an interim caregiver from Havar Inc., a non-profit that provides various support services for the disabled, has known Patty for nearly five years and plays both roles as paid staff and natural support. They have become friends. Patty is also close to her sisters and often quotes advice they’ve given her. “I used to wish I was the only child, and now I’m glad I’m not the only child,” Patty says with a smile. Her sisters are equally thankful, and say Patty often helps them. At Fruth’s, Patty is good friends with the other store employees, and she’s friends with the customers as well. She often strikes up lively conversations and gets to know them. Patty’s co-workers also help her in little ways throughout the day. They prop the heavier store doors open for her and make sure the trash container is close enough in its gravel lot for Patty to reach it. They make sure she can clock in and often give her cigarettes. Patty also participates in the annual employee recognition ceremonies and Secret Santa gift exchange. Melissa, who is known as “Missy” to Fruth’s employees, is another major support in Patty’s life. When Patty is struggling with her mental health, Melissa is very understanding about absences and missed days of work. “I love Missy, my boss,” Patty said, noting that Missy has never yelled at her. “I could take her home with me — let her be my sister.” Christine Miles gives Patty Naffziger a hug at Passion Works Studio in Athens, Ohio. Naffziger works as an artist at Passion Works on Fridays. Naffziger has probably been here since the very beginning and has been making beautiful work ever since, said Miles, an artist-in-residence and production aide at the studio. 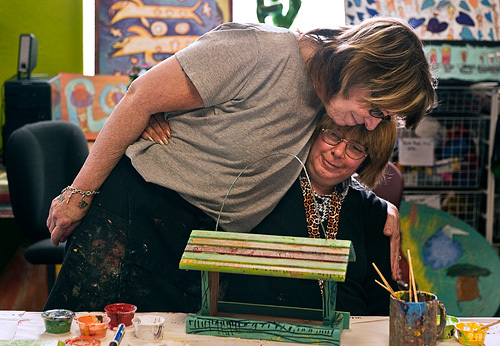 Passion Works Studio brings artists with and without developmental disabilities together to create artwork to sell. Patty fills her weekends with activities, too. On Fridays, she goes to Passion Works Studio, where she paints pictures of houses and decorates birdhouses and purses. All of her work is brightly colored, and the people and animals in them are always smiling. She often meets with her sisters and her parents on weekends. She sees her boyfriend, Mike Weekley, a couple nights a week. They met at Beasley Mill Apartments 10 years ago when Patty lived there and enjoy going to Wal-Mart, a movie, or occasionally out to eat. When Patty goes to Wal-Mart, people sometimes will talk to her because they recognize her from Fruth’s. She also spends time on her apartment complex’s patio with her neighbors and friends, and she enjoys having visitors. “Patty is so gregarious and outgoing that she makes friends very easily, and so I think she’s just way more competent at making her way in the world than she is given credit for,” Deni said. Building those friendships and networks allows Patty to become closer to living a completely independent life. “The goal is to get our consumers to be as independent as they could be,” Margaret said. “I think Patty and everyone has that opportunity to get to that point. 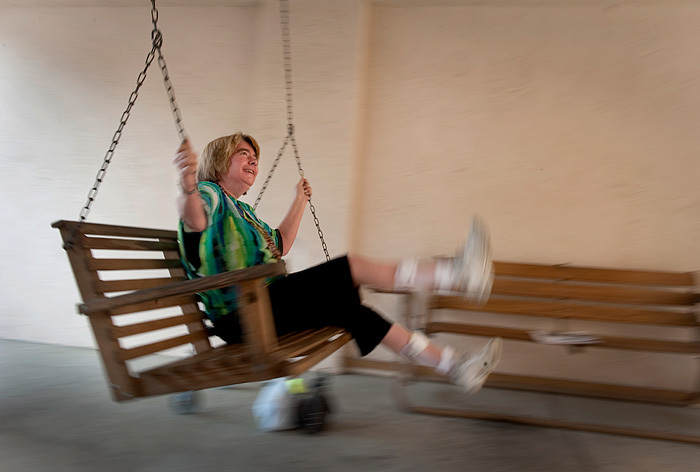 I would love for Patty to get there.” While waiting for her mom to pick her up for a doctor's appointment, Patty Naffziger swings in the courtyard of Carpenter Hall. "I love to swing."